You can find part 1 of the Evergreen series here. You can find part 2 of the Evergreen series here. indestructible: This card cannot be destroyed by card effects or lethal damage. Indestructible has been around since Alpha on only one card; Consecrate Land. It makes your cards literally indestructible – they can’t be destroyed. They can, however, still be exiled or returned to your hand or deck. It’s fairly straight forward when it comes to what it does. There are also a few cards, including Consecrate Land, can grant indestructible. The most notable are Avacyn, Angel of Hope, Darksteel Forge, and the new Sliver Hivelord. These cards grant indestructible to a significant amount of your board – whether it be the whole thing, all of your artifacts, or all of your slivers. Intimidate: This creature can only be blocked by artifact creatures or creatures that share a color with it. Intimidate is a kind of evasion that was granted to Red and Black in Zendikar block, essentially giving them unblockable against everything but their own colors, and artifact creatures. In fact, Intimidate was introduced to replace Fear – a mechanic that was identical except it made the creature able to be only blocked by Black and artifact creatures, rather than creatures that share a color and artifact creatures. Again, another straight forward mechanic. Landwalk: Creatures with _____walk cannot be blocked by players that control lands of that land type. Landwalk is actually several abilities put together: Plainswalk, Islandwalk, Swampwalk, Mountainwalk, and Forestwalk. These aren’t the only ones, though – there’s also Legendary landwalk, and nonbasic landwalk, printed on a few cards. Mechanically speaking, Landwalk is identical to unblockable except for the conditions under which the ability works – they have to control a land of the type the walk is looking for. Lifelink: Whenever this creature deals damage, you gain that much life. Lifelink is one of the most important mechanics when it comes to Tempo – being able to gain life while on the offense is very powerful. Primarily in White and Black, any time that a creature with lifelink deals damage, you simultaneously gain that much life. One of the important things to note about Lifelink is that it gains you life based on how much damage is dealt. If, for example, Griselbrand blocks or is blocked by a 1/1 flier, you would gain 7 life, not 1. It’s based on the amount of damage that creature deals, not based on the amount of damage that is relevant. Protection: This [object] cannot be blocked, targeted, dealt damage, or enchanted by anything of this [quality]. Protection is the clunkiest mechanic remaining in the game to this day. MTGSalvation makes a good point of mentioning the mnemonic for remembering what protection does: DEBT. Targeted by spells of the given quality, or abilities with sources of the given quality. Protection feels like some kind of hybrid between intimidate and selective shroud – it’s less complicated than it is clunky. For example, White Knight has protection from black – which is common, as most color have protection from their enemy colors. This creature cannot be blocked by black creatures, damaged by black creatures or spells, targeted by black spells or abilities, or enchanted with black enchantments. But of course, any other color can hurt White Knight. Regeneration: The next time this creature would be destroyed this turn, it isn’t. Instead, tap it, removal all damage from it, and remove it from combat. Regeneration is still the most complicated mechanic in the game. Generally an activated ability, Regeneration allows creatures to avoid death – in the most complicated ways possible. The wording however is straight forward. Namely, “if this would be destroyed.” What many beginning players don’t understand that Regenerate is used before it dies, not after it goes into the graveyard. It’s a replacement effect – if being the operative word. This effect protects you from just destruction – being exiled or being given -x/-x does not give you the option to regenerate as these don’t “destroy” the card – it just puts them into the graveyard as a “state-based action” – something that I’ll talk about next in the series. Honestly, I think the main problem with regenerate is the lack of reminder text on these card. As it is an evergreen keyword, it rarely gets reminder text despite being a complex ability. Trample: If a creature you control would assign enough damage to its blockers to destroy them, you may have it assign the rest of its damage to defending player or planeswalker. Trample is another one of those abilities that has been around since the beginning that is fairly straightforward. Most of the time, this means that you deal damage equal to the toughness of all blockers, any left over damage goes to the defending player or planeswalker. 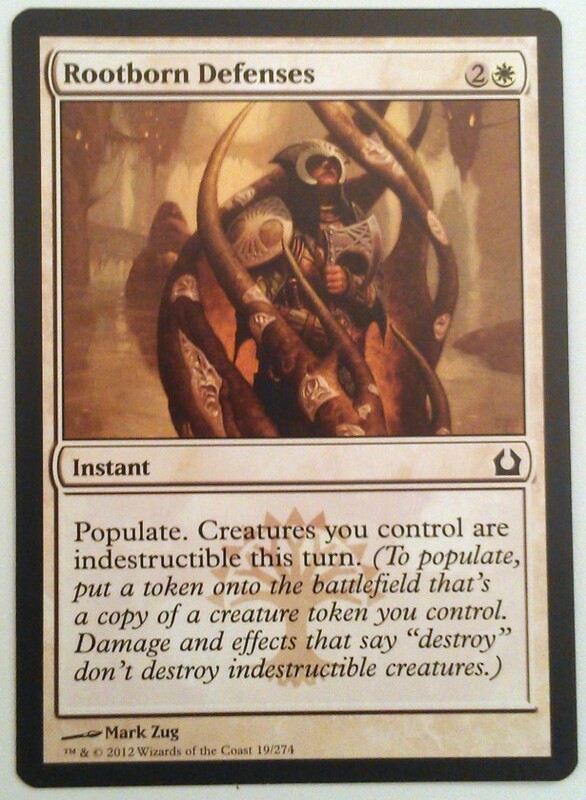 For example, a Pelakka Wurm – a 7/7 trample – attacks a player with 6 life. That player then has the choice to block with either a 1/1 Reassembling Skeleton or a 2/2 Shimmer Myr. Usually, you would choose to block with the 1/1 as a “chump block” (another term I will go over in another article) as you lose the least power and block the 7 damage due to the fact Reassembling Skeleton can return itself to play later. However, due to the fact that Pelakka Wurm has trample, if the player was to only block with the 1/1, he would lose – as he would take 6 trample damage. Now the player can either block with Shimmer Myr in order to take 5 damage and survive, or block with both creatures and take 4. Most of the time, it’s generally better to just take the trample hit than to chump block part of the damage – sacrificing creatures to prevent a little damage usually isn’t worth it unless you’re killing the creature. Vigilance: Attacking doesn’t cause this creature to tap. Vigilance is another ability that has been around since the beginning, but wasn’t key-worded until as late as Champions of Kamigawa. This is another straight forward ability – you can attack and still be open to block your opponent’s creatures. Like Lifelink, it’s a tempo ability – you can hit your opponent and they can’t necessarily attack back due to still being open for blocks. Now, to clear up some minor confusion I’ve seen before, even if a creature has vigilance, it still can’t attack the same turn it enters – some people think that as it doesn’t tap to attack, it is able to attack the same turn it enters. Just a minor mistake I’ve seen before. I’m not sure what I’ll do next, but you can expect another Games and Mechanics article very soon. Soul of New Phyrexia is a card I didn’t expect – while we had the other two spirits at the time spoiled (Soul of Zendikar and Soul of Ravnica), I was expecting it to be a 5 card cycle, one of each color. And then we see this fantastic monstrosity taking up a colorless spot in the cycle. Soul of New Phyrexia is 6 colorless for a 6/6 Avatar artifact creature with trample. Right there already makes me love this card – being an artifact gives it a ton of versatility, and being colorless makes it playable enough to play in any colors. In addition, we have already seen the success of Wurmcoil Engine in Standard and Modern – the card is fantastic at the same card slot. 5: Permanents you control gain indestructible until end of turn. Right there is pretty fantastic, as at 5 mana it can easily make itself indestructible along with all of your other permanents, and is very easy to sink mana into as it doesn’t have the colored requirements of the other spirits, allowing it to be playing in multi-color decks as well. 5, Exile this card from your graveyards: permanents you control gain indestructible until end of turn. And also fantastic. An ability usable out of the graveyard to catch your opponents off guard is fantastic in any situation. I’m excited to play this in my Commander decks, and I feel that it’ll be a lot of fun to drop on the table time after time. Rootborn Defenses? – Return to Ravnica Spoiler? While the Validity of this card is still in question at the moment, I thought I should at least mention this card. For 2W, Rootbound Defenses introduces what seems to be Selensnya’s new mechanic, Populate, which I see to be a very abuse-able mechanic. It creates a copy of any token you control. And then, it makes all of your creatures indestructible, for a whole turn, for only 2W. Personally, I don’t know if this card is real. It seems rather overpowered for only 3 mana, and in Green/White Tokens (which will be good in standard if this is real) will be broken, dodging board wipes and fatal blocks, and populating their tokens. You can find discussion on the legality of this card here. When people heard about Creepy Doll, they were hoping for Wizards to out-do their old Stuffy Doll, a rare from Time Spiral. For 5 mana, it gave you a 0/1; not very impressive. But it’s indestructible, and whenever damage is dealt to Stuffy Doll, it deals damage to the player you chose when he came into play. Stuffy Doll can also deal 1 damage to itself and therefore hurt your chosen opponent. Creepy Doll isn’t as good in Multiplayer formats, but it was played in Standard while it was in, creating a creature that made your opponent weary to swing into the red zone with. All-in-all, much better than Creepy Doll. Creepy Doll is interesting, however. Also a 5 drop, but a 1/1 indestructible instead, that whenever it deals damage to a creature, you flip a coin, and if heads it kills the creature. Like Stuffy Doll, it makes your opponent’s think twice about attacking, but it’s much less effective as a deterrent than Stuffy Doll, as it only kills the creature half the time. But I enjoy the flavor text; “A child’s porcelain doll went missing one night, as did a pair of kitchen shears and the town magistrate.” It’s a flavorful card, but not really playable outside of limited.